We have a team of consulting arborists to help you with your requirements for arborist reports, tree surveys, tree management plans and more. 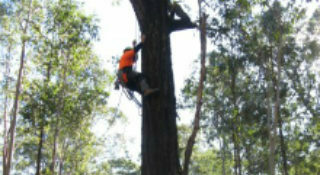 Our consulting arborists offer arboricultural services under the Australian Standard AS:4970-2009 Protection of Trees on Development Sites, and under the Quantified Tree Risk Assessment (QTRA) system. We offer a range of specialist advice on trees for developments and other settings. Our team is responsible for carrying out tree assessments, reporting, consultation with clients for tree protection measures on sites, and providing recommendations for tree removal and retention. Our areas of experience include rail and road infrastructure, residential projects and heritage. Our assessments identify tree species and determine tree health, vigour, age and landscape significance, and any site constraints. For enquiries, please contact Elizabeth Hannon at the details below.